Here's another building that's made the private-to-public transition. It started out as the mansion of a Portuguese businessman, Alexandre de Brito Amorim, who arrived in 1851 and established the Companhia Fluvial do Alto Amazonas, which not only plied the river but until 1881 ran a Manaus-Liverpool service. 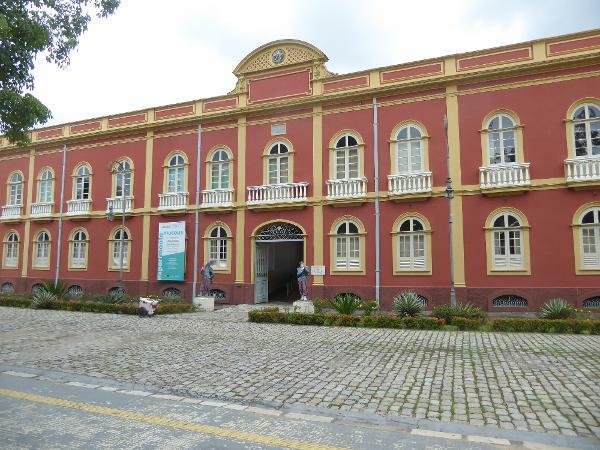 Amorim sold the house in 1867 to an officer of the national guard; subsequently the building housed the presidents of Amazonas until becoming the state's military police headquarters and, after 2007, another museum. Amorim had stiff competition on the river. One competitor was the fabulously wealthy--until the sad day he wasn't--Baron de Maua, alias Irineu de Souza, who among many other projects set up the Navigation and Commerce Company of Amazonas, which merged in 1874 with the London-based Amazon Steam Navigation Company. By 1903 the company owned 33 steamers and operated five lines on the river and its tributaries.